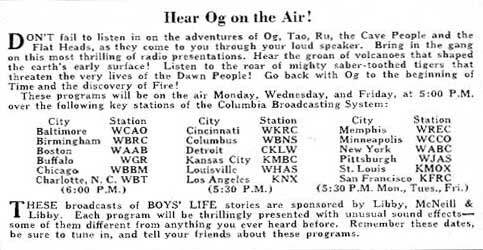 Apparently no recordings of the Og radio shows survive, nor any scripts or transcripts. If you (or your parents or grandparents, et al.) remember any of the episodes, please contact me, and we can try to preserve these memories, even if they are incomplete. "...according to a Variety review. Soundmen Herb Johnson and Louie Wehr were cited for noisiest effects and for creativity in bringing brontosauri and other beasts to life." 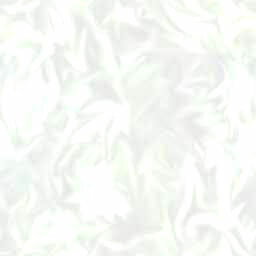 Have you ever heard of Og? TIME ROLLS BACK a hundred thousand years for you in these adventures of Og... back to a time when strange and horrible beasts roamed the earth... terrible killers who relentlessly stalked the families of men. Exciting, thrilling entertainment! Master radio showmen will re-create for you the crashing thunder of volcanoes belching fiery destruction... the trumpetings of enraged woolly mammoths... the snarls of sabre-toothed tigers... the clamorous voices of the fear-haunted cave people... the brave words of Og and his faithful friend Ru. 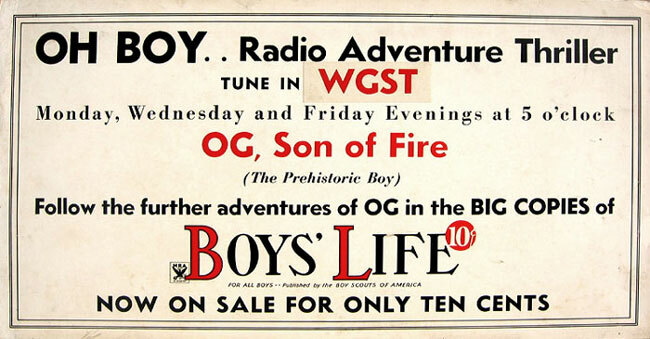 Irving Crump, the man who created the character of Og for Boys' Life, has written a whole series of Og episodes for this radio program. They're new Og stories, never published. And you'll enjoy them as you've never enjoyed these stories before, because they'll live for you when you hear them on the radio. 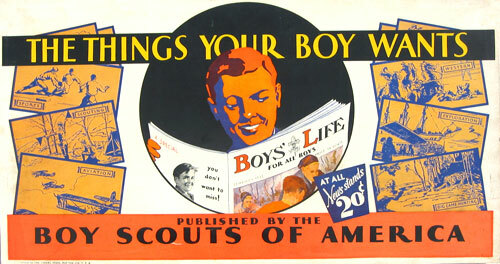 This program is sponsored by Libby, McNeill & Libby  which, as most Scouts know, is the company that has given official Boy Scout uniforms and equipment without cost to thousands of boys, in return for the labels of Libby's Evaporated Milk. 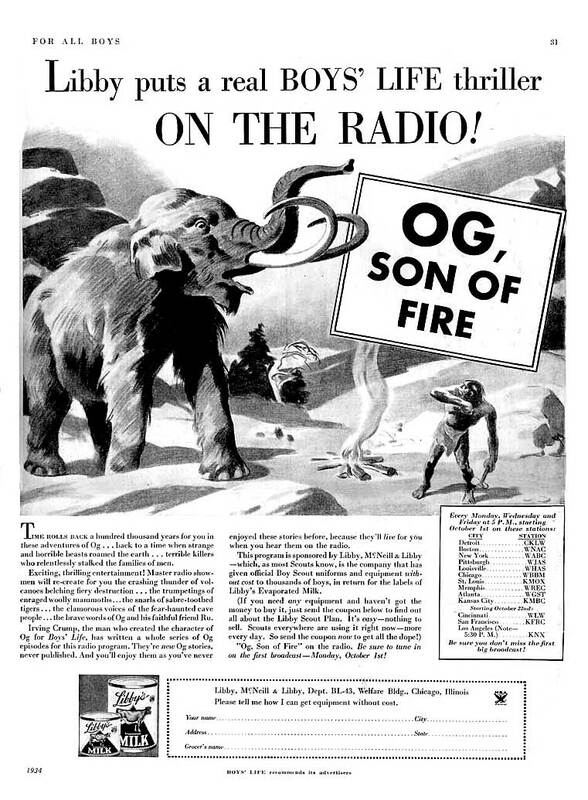 "Og, Son of Fire" on the radio. Be sure to tune in on the first broadcast  Monday, October 1st! along with the Og story "Death to the Red Beards"
reminds listeners that Og had returned September 30 from the summer break. December 27, 1935 was the last broadcast of the series. 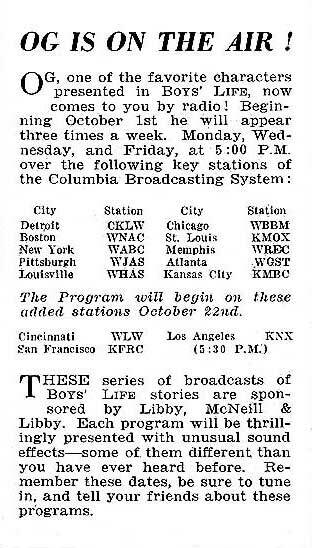 According to Jay Hickerson's "Ultimate History of Network Radio..."
no shows from this series have survived. 1936. 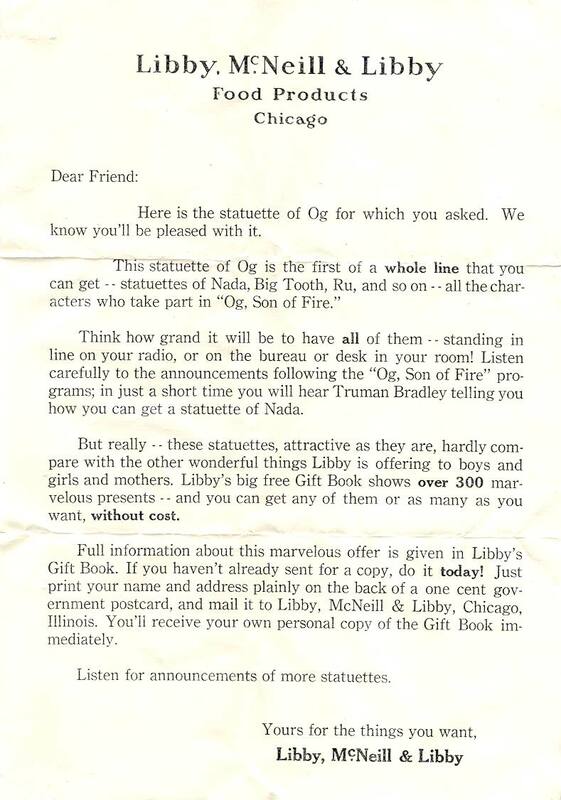 Og - Son of Fire - the Big Little Book. "Based on the famous radio adventure series by Irving Crump".